Boulder County, Colorado is home to hundreds of scenic farms, some dating as far back as the Colorado gold rush of the 1860s, with over 130,000 total agricultural acres ALL with stunning views of the Rocky Mountains above to the west. The diverse and varied topography of the Boulder area – from foothills, mesas, buttes, to wooded creeks and stretches of prairie – give each farm a unique feeling and a beautiful view unlike even its closest neighbor. And the best way to experience the nuances of the countryside (in our humble opinion) is by bike, because most special places are too-quickly missed when traveling by car. As such, rural Boulder has developed many top cycling routes, many of which pass by farms, flocks, orchards and wildlife sanctuaries. Yet most who bike the area have never had the pleasure of stopping in for a visit at a local farm for a refreshment and a tour. There’s something special about riding the back roads and bike paths to reach these small farms, and the best is to be welcomed in for a farm-fresh snack or dinner! Even farm-to-table restaurants pale in comparison to enjoying a meal right on the spot where your food was grown and just harvested. And there’s rarely anyone better than a local farmer to share the sense of place and its history, the unique flavors of its crops and how they were grown and prepared. Here on the farms, local food is not a concept or a hot new menu item, it is the very essence of life and livelihood..
Each month during the growing season you’ll experience a evolving sampling of the freshest chilies, greens, beans, beets, carrots, lettuces, sweet corn, garlic, kale, onions, peas, potatoes, pumpkins, squash, tomatoes, pastured eggs and more. And, when you’re lucky, there are sometimes special varieties that most people have never tried or even heard of before. Although the Colorado climate is best suited for dry-tolerant crops like hay and wheat and livestock grazing, numerous irrigation ditches – some originally hand-dug – bring snowmelt out from the Indian Peaks to Boulder area farms out allowing vegetables, berries and fruit trees to flourish. During dry times of year on the high plains, our local farms are islands of green that are even sweeter to visit. Thanks to the irrigation network bringing snowmelt down from the continental divide 9,000 feet above, a farm visit can literally feel like a Colorado oasis in the summer months. The rural areas we pass through include wildlife habitat for eagles, hawks, songbirds, prairie dogs, and many many other wild animals. It’s a rare tour that doesn’t include a memorable wildlife spotting, so bring your camera. Plus many growers employ permaculture on their farms, a practice of creating habitat within the farm ecosystem so that nature can do the work of managing pests and improving soil fertility. It may sound hippie, yet the system can work extremely well by reducing input costs and producing extremely nutritious food. Come on a tour, get your hands dirty and experience for yourself the future of organic farming! The area has been a hub for the local foods movement that’s swept the US these last 15 years, and many new farms have cropped up inspired by this collective desire to reconnect with real, healthy food and build local living economies. The shift has brought some exciting new farms to the area, and each years riders encounter more and more pastures filled with sheep, goats and mobile chicken houses supplying quality food to local markets, restaurants and CSA customers. 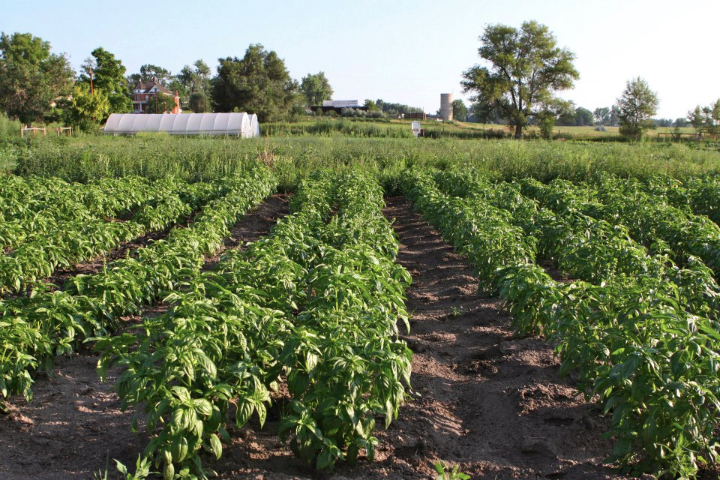 Take 63rd Street Farm which we visit on our Thursday happy hour ride, for example. Founded in 2007 by Amanda and Brian Scott with a motto of “growing food, friends and futures,” this farm on Boulder Creek includes organically-grown veggies and pastured poultry, plus greenhouses and a handmade brick pizza oven that get fired up for on-farm feasts! Further north in Boulder County, Sol y Sombra farm focuses on heirloom veggies variety (the original, best tasting varieties that don’t ship well coast-to-coast), as well as fruits, herbs and flowers. The farm dates back to the early 1900s, and owner Allison Edwards prides herself on continuing the tradition with a goal of “changing the way America eats.” This includes inviting bike tours out for an incredible 4-course meal, connecting with the community at nearby farmers markets and even helping educate kids about real food in local schools. And it doesn’t hurt to dine looking west at Sol y Sombra’s killer view of 14,259 foot Longs Peak – a stunning mountain that provides a one-of-a-kind backdrop for a memorable farm dinner. Other farms we’ll pass are even older still, which brings us to a little history on the area.. In the words of HistoryColorado.org, within a few decades of the 1859 gold rush, “Boulder County went from a Native American hunting ground covered with prairie grasses to bustling mountain mining camps supported by successful farms on the plains. Settlers.. broke sod, established farms and ranches, built irrigation systems, founded farming communities, and organized communal agricultural societies and county fairs – all in less than thirty years. Fast-forward to today, Boulder continues to chart new territory in the US local foods movement. I an effort to conserve farmland from development in this popular area, the County of Boulder has purchased 25,000 acres of agricultural land and given it permanent-conservation status. Nearly 2,000 of those acres are certified organic and the County is working to transition over 1,200 more areas to organic by 2020. And some initiatives to protect farmland have been controversial. The County just passed a GMO-ban that will take effect on county-owned farmland between 2019 and 2021 depending on the crop. The move has been widely criticized by large players in the ag industry but lauded by organic growers as as key step in safeguarding genetic diversity and preventing contamination from neighboring GMO crops. Regardless, Boulder continues forward as a community willing to chart new territory and offer a rural experience that is being lost in many other places around the country. But we wax on – these conversations are much better had while riding the back roads and bike paths of the area or sipping a beverage at a beautiful farm on a tour. There’s really nothing quite like breathing the fresh air and tasting the food revolution for yourself – give us a call and we’ll show you around!